Like so many, my health story is complicated. 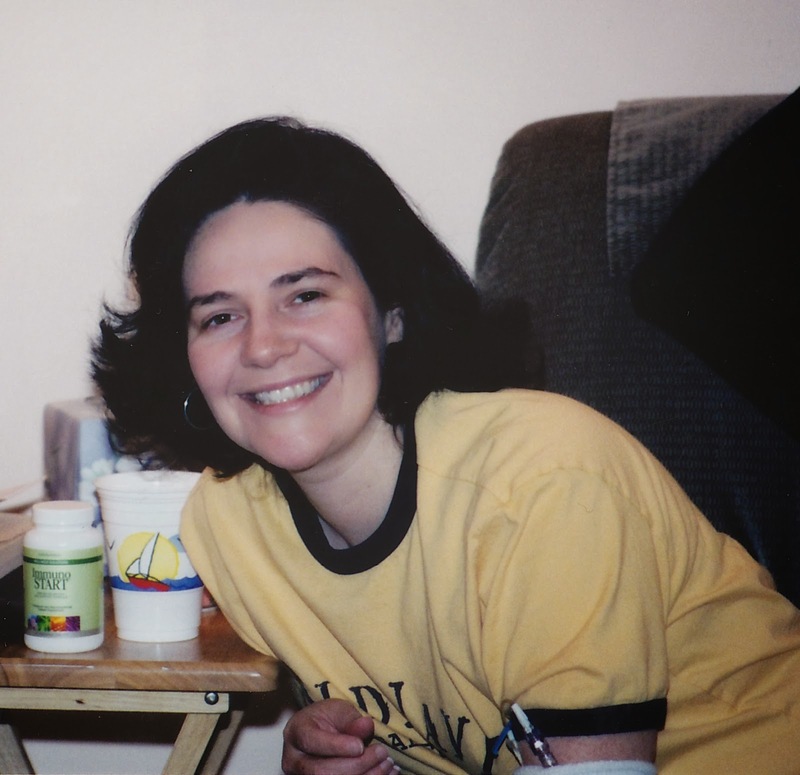 I've lived with chronic illness for 23 years. 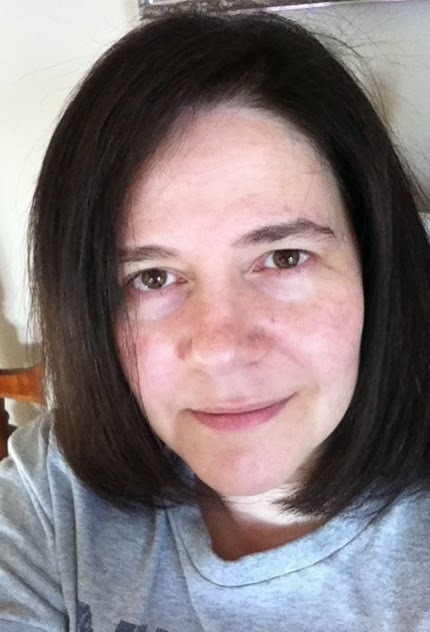 I was misdiagnosed for 16 years with a variety of things, including being told by several neurologists I had MS. This was the"official" diagnosis I had for many years, but deep in my heart; I knew it wasn't right. Years later this would prove to be true. If you're interested in knowing more about this, please read my blog post Journeying Through Chronic Illness. The major decline in my health started after having an oral surgery in 1994 to remove abscessed bone from my maxilla. It was after this initial surgery that I first became ill. I developed mono (Epstein-Barr) which became chronic. A few years later I had two more subsequent surgeries to deal with complications from the first one. The very first Lyme-related symptoms I ever recall having were eyelid twitches followed by an optic neuritis. Please read Oral Spirochetosis, Lyme, and Other Chronic Diseases for more details. I personally believe that surgery opened the door wide to the Borrelia (Lyme) bacteria, which was already present in my body. I don't know the exact date I was bitten by the tick or ticks that transmitted Lyme and some other infections to me; but I clearly recall pulling many ticks off growing up through the years after playing, camping or hiking outdoors at home, in the woods, at local parks, and on my grandparents farm. Some were attached. The only bull's eye rash I've ever had came out in 2012 during some of my treatment. I also believe that surgery led to deep immune suppression and nervous system dysfunction by both the Borrelia bacteria and the Epstein-Barr virus. This began a 16 year nightmare of misdiagnosis filled with myriad doctors appointments, MRI's, angiograms, electromyograms (EMG) evoked potentials (EP), nerve conduction studies (NCV), tilt table tests (TTT), lumbar punctures, blood work and other specialty lab testing, hospital stays, and many different therapies. It was also filled with deeper growing sickness, exhaustion, debilitation, vertigo, unsteady gait, and pain. I had to quit work as a Radiologic Technologist in 1995, at the age of 24, because I was too sick and fatigued to function, and I was having severe vertigo attacks. I also had to move back home with my parents that same year. Life as I knew it then came to a crashing halt. It was overwhelming and scary. I developed a contracture in my right knee and began physical therapy the next year. 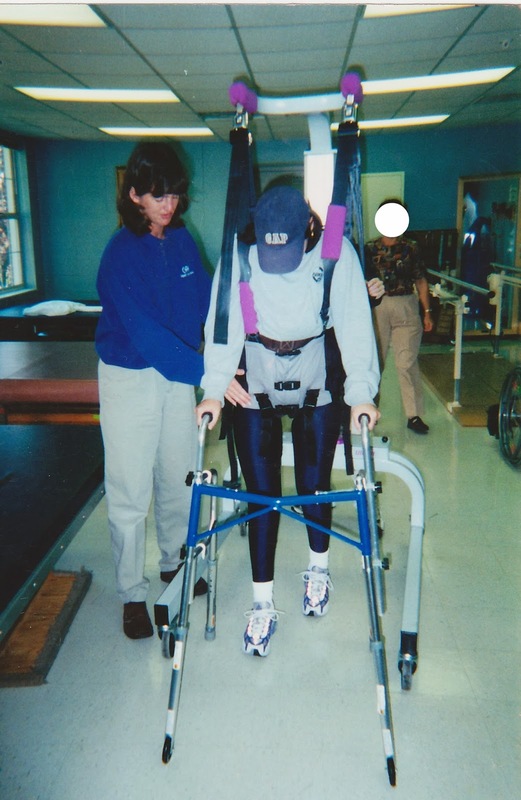 It became even scarier in February 1997 when I could no longer balance or walk on my own. The contracture wasn't getting better and my gait became so unsteady and abnormal; I suddenly found myself confined to a wheelchair. Little did I know, this was only the beginning of a very long and difficult road. June 1998. Inpatient therapy at CHRH. I was 28 here. Standing for the first time in over a year strapped in stall bars and I was feeling pretty sick. 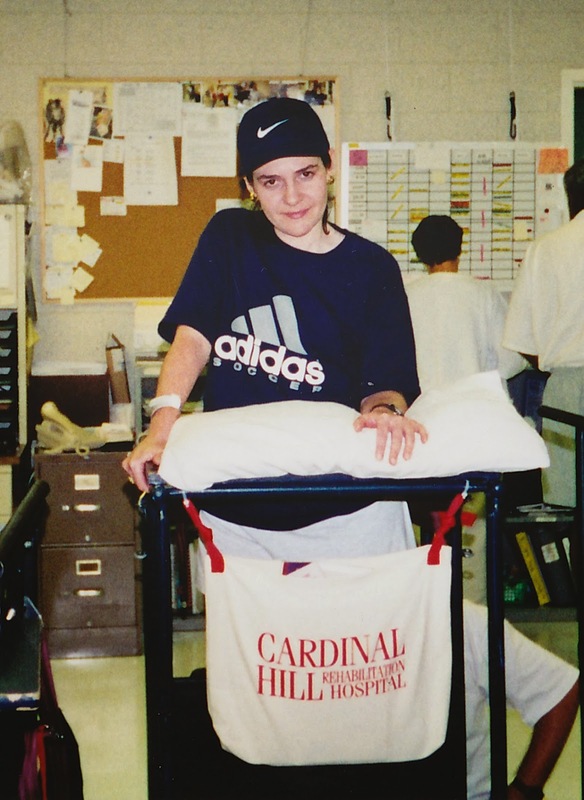 I had physical therapy for several years as both an inpatient and outpatient at Cardinal Hill Rehabilitation Hospital in Lexington, Kentucky. Unfortunately, we didn't know I had Lyme yet. March 2000. Outpatient therapy at CHRH. Working with Mindy, my physical therapist. I'm harnessed into the Lite-Gait system. This prevented me from falling but also required my body to move. Very, very hard work. Still no knowledge of Lyme. Throughout the years, we've struggled to find what has really been causing my body to be so sick and dysfunctional. I also started having more physical therapy to try and rehab my balance and gait and to strengthen my muscles. This was interlaced with more ongoing doctors appointments, labs, and testing. Doctor after doctor, test after test, diagnosis after diagnosis, and one drug after another only led to more questions and deeper frustration. And I continued getting worse. I had to quit physical therapy because I became even more severely fatigued. So much so; I literally could not get out of bed to take a shower much less go anywhere or do anything. I started running fevers daily. I hurt everywhere; muscles, joints, and lymph nodes. My spleen and liver ached and started swelling. I was having a lot of burning, tingling, buzzing, and numbness in different parts of my body. My throat was sore all the time. The light hurt my eyes and I started having terrible headaches. My vision got blurry. My digestion grew worse. I frequently became short of breath and developed an arrhythmia. My muscles grew weaker and began to atrophy. I could hardly ride in a car at times because it would make me feel so dizzy and nauseated. I felt like I had the flu or mono all the time. More and more of my body systems became involved. And I still could not balance myself or walk on my own. This became my new normal. An integrative medicine doctor eventually found I had high levels of chronically active viruses (Epstein-Barr Virus, CMV, Varicella-Zoster Virus) and Mycoplasma. He clearly felt I had an immune deficiency and believed the reactivation of these viruses was secondary but didn't really know what the primary or underlying cause was. I agreed. We tried anything and everything but nothing ever gave me lasting relief or helped to significantly improve my overall health. 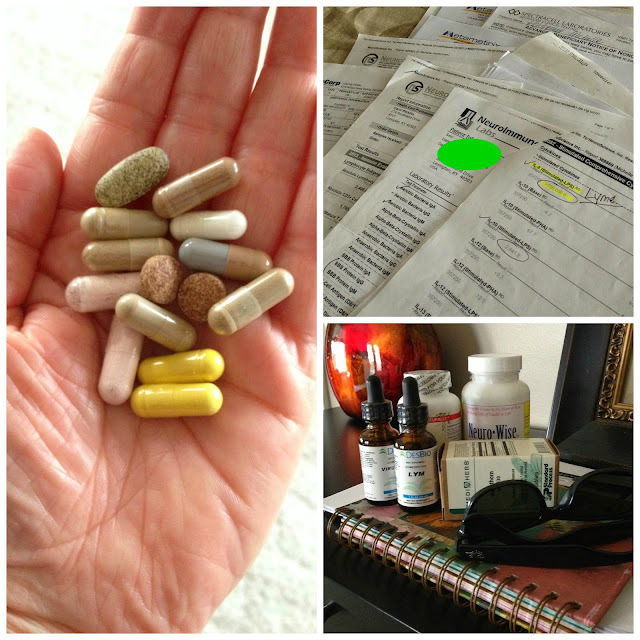 I kept getting sicker and the chronic fatigue became even worse; bone-crushing exhaustion. I've been totally debilitated and bedridden for many stretches of days. Those days turned into weeks. The weeks turned into months. And months turned into years. Seems like a bad Lifetime movie but it's absolutely true. It has been deeply frustrating, discouraging, and lonely. And some parts of this I just have no words for. July 2003. Immune Recovery Clinic. Atlanta. Went for more intensive treatment. Had a PICC Line put in for long term IV therapy for chronic viruses and Mycoplasma. I believe this intensive therapy helped to preserve me in some way. However, we still didn't know the root of my illness was really Lyme disease. This discovery wouldn't come for seven more years. It was in 2010 that I was finally diagnosed with Lyme. 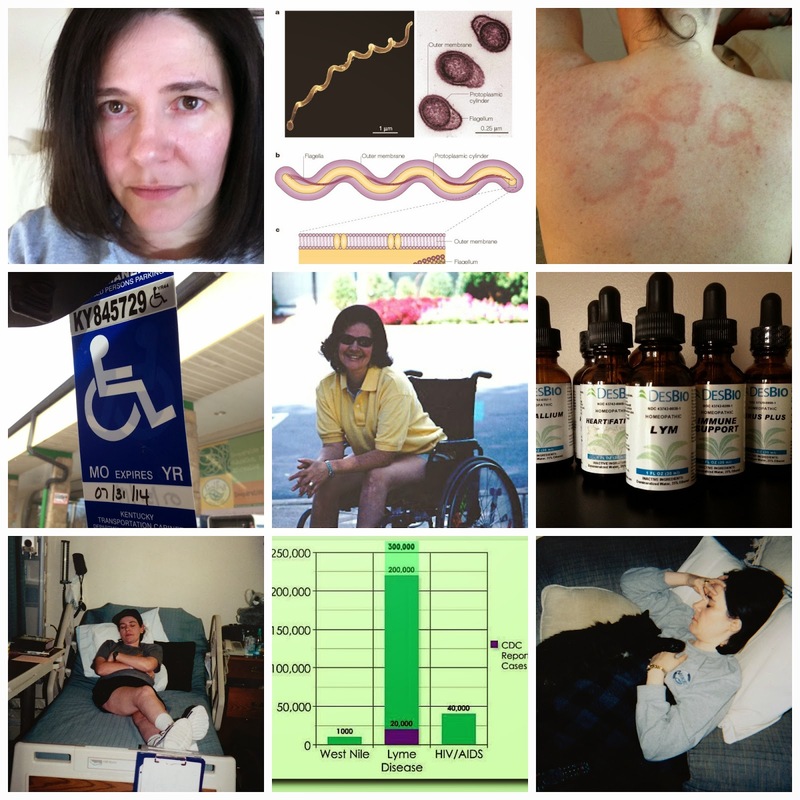 It took sixteen years to find out I've had Lyme disease all along, and all along it's been inside my body; disseminating and creating dysfunction and damage. It's been a literal fight for life. My present doctor ultimately discovered this truth. We have worked diligently together to find answers and try to improve my health. It is an ongoing process. In consulting a few other doctors; we've also found some co-infections and other significant pieces along the way to this crazy puzzle, but Lyme was certainly a missing key. It's been a roller-coaster ride, to say the least, but we've pressed on. And we're still pressing on. By the time we found Lyme, it was in a persistent, chronic state - and it still is. The Borrelia (Lyme) bacteria has infected my nervous system (neuroborreliosis) and created a lot of immune and cell dysfunction. Lyme is truly an insidious and disabling disease that can cause tremendous damage in the body. It, and other tick-borne infections can make you extremely sick, fatigued, and debilitated. The longer one goes without treatment; the more damage that's done. This is why proper diagnosis is so important. And, unfortunately, this is why so many of us are where we are today - because of delayed or misdiagnosis. June 2013. During some ongoing Lyme treatment. Lyme is very difficult to treat once Borrelia spirochetes have invaded cells and begun replicating. But you never give up trying. I first began a full Lyme treatment in 2010 also and while we have taken a few breaks; I've been on some form of treatment ever since. After consulting with an immunologist in September 2013, we found out that the Lyme infection is still active; even after three previous years of various treatments. I think this reveals the chronicity and complexity of this disease, especially when left untreated for so long, which allows the Borrelia spirochetes (Lyme bacteria) to disseminate throughout the body quite easily. A long term Lyme infection almost always involves co-infections and greater dysfunction in the body. This is an all too common story. Other tick-borne infections are frequently involved (Babesia, Bartonella, Ehrlichia, Relapsing Fever, Rocky Mountain Spotted Fever, Mycoplasma, etc). Mold is often an issue (Candida, Aspergillus, etc). Viruses (Epstein-Barr, CMV, HHV-6, Varicella-Zoster, etc.) and other bacteria (Strep, Staph, etc.) get reactivated because defense mechanisms of the immune system are often damaged from the Lyme infection. So the immune system can no longer control or keep past infections properly suppressed and they reactivate. To say there is much collateral damage with these pathogens is an understatement. Multiple organs and body systems become involved. Activation of the inflammatory cascade often occurs. Hormonal imbalances rooted in prolonged inflammation affects adrenal and thyroid function, which can induce glucose intolerance and insulin resistance and only add to already persistent fatigue. This can lead to adrenal and thyroid exhaustion, which is serious. Liver and spleen dysfunction can occur. And nutritional deficiencies often result from years of chronic infection because pathogens frequently rob the body of nutrients for their own survival. It literally creates a domino effect throughout the body. So the body gets extremely taxed with the barrage of multiple infections and inflammation. Healing is, therefore, a process that not only requires stopping the Lyme bacteria from replicating but dealing with all the pathogens (other bacteria, viruses, mycotoxins, parasites) involved. It also requires repairing all the damage that's been done by the different pathogens themselves and restoring balance back to the body's systems that have been so affected. Addressing genetic mutations, which affect the body's ability to detoxify, is also necessary. If you cannot detoxify properly, you cannot heal fully. And the longer one is misdiagnosed or delayed in treatment, the more complicated and difficult this entire process is. So it's been for me and many others with chronic or persistent Lyme disease. I've been through so much but it just isn't possible to totally put the past 23 years of my life down into a few paragraphs and photos. Nonetheless, this is a summary of some parts of it. So where am I now in all this? Certain things are better, which I'm truly grateful for, and other things are not. And then some fall in between and fluctuate. I'm still working to be well and it is truly an ongoing work. I believe this speaks quite clearly to the severity, chronicity, and complexity of Lyme disease. It is a long, difficult road I'm still traveling. The improvements: 1. After much physical therapy and a lot of hard work over the span of several years, the contracture in my right knee has greatly improved. 2. Although I'm still in a wheelchair, my movement and balance are much better overall. 3. Fatigue and fevers are still an ongoing issue for me. However, it's not quite as severe and crushing like it's been for so many years. You honestly never think something like this will happen to you (or someone you love) until it does. But if I've learned one thing through these past many years it's this: faith, hope, love, determination, and perseverance will get you far. I'm still working every day to be well. I won't quit (although I've had moments I wanted to). I still have hope and will overcome this because God and I will see this through. My Lyme journey goes on. Amazing journey... thank you for sharing. You are a brave warrior my friend. My prayers continue. God Bless you always. Thank you for sharing. Can't thank you enough.